Have to tip my hat to you on this creation of yours. It is top notch. I was looking at the A-13A and noticed that the back side of the hand of the center counters are wider than yours. I was thinking you could widen yours and lengthen them slightly to make up for some of the diameter of the counter weight portion. Just a thought. paolorange, Chaz Goldenrod and longstride like this. 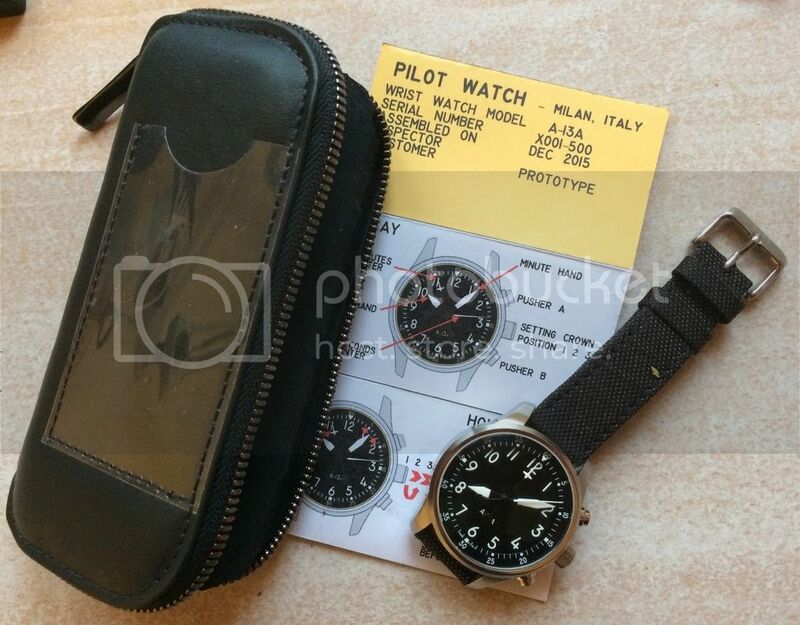 +1 on the GMT function - I use GMT more often than a chronograph whilst flying. I'd love to see this as a Kickstarter project though. The fact that this watch looks perfectly at home sat next to a Speedy is fantastic. Armadillo, yes one of the many configurations of the central hands that I've calculate featured a wider back side. Unfortunately it met the unbalance requirements, but the total weight exceeded the maximum allowable. The reason in that the most efficient way to balance the hand is by adding mass away from the pivot point. You can surely add mass closer to the pivot point but then you need more mass to achieve the same unbalance ratio. The stringent unbalance ratio specified by the manufacturer of the movement is intended to avoid hands slippage in case of lateral shock. I made some poor man "g-shock" tests, basically I wear my watch while jogging, golfing, riding mountain-bike and motorbike, shooting (not really a torture test , but quite demanding activites) and I didn't experience so far hands slippage. Last edited by paolorange; May 1st, 2016 at 10:29. Love Love Love the watch and put me on the would buy list........Any chance for a lume shot of the watch in progress?? I agree...Kickstarter please. I've subscribed to see updates as well! Really admire your work paolorange, any updated pics? Add me to the BUY it list also. Thanks you guys for your encouragement. I really need that right now. @Connavar. Lume right now is...adeguate. I mean, I can easily read the watch at 6:00AM in the darkness when most of the glown is gone, but it's not like my ultra bright vintage Omega Seamaster 300, my benchmark when it comes to lume performance. I think that for the purpose of this watch it's acceptable, but I confess I wish it could glow more. I'm investigating if I can have that feature improved, but it doesn't look so easy. Also remember that almost all hands manufactures declined my request for aluminum hands. Not easy. I'm waiting the first prototype of a new crown, slightly thinner and with an airfoil engraved, as well as the new buckle and the new case back deep acid etched. If everything goes OK I should have my watch 99% completed and I could start with a cost analysis. slaterbj, eljay, avusblue and 3 others like this. Dear Paolorange, Really envying you this beautiful project. Complimenti! Please include me in your list of those who would be happy to acquire one of your designs.